It must have been hard. Raising me. You were so young. Just 21, right? Just a kid? A kid with a kid. I still feel like one of those. Is it the same for you as it is for me? Did you think about your future and assume it would all just click one day? Magically? When I was in grade school, I knew I’d finally figure it out in high school. When I was in high school, I knew I’d finally figure it out in college. When I was in college, I knew I’d finally figure it out once I got out in the real world. Once I got out in the real world, I knew I’d finally figure it out once I settled down and got married. And now I’m divorced. Single dad. 35. And I don’t have anything figured out. At one time, that might have terrified me. But not anymore. Because I’m beginning to think the older and wiser we get, the more aware we become of how little we ever really know or understand. We don’t have much control, and we were delusional whenever it felt like we did. Each day I wake up, I get incrementally closer to making total peace with that: I am not in control. I don’t know what’s going to happen next. But everything’s going to be okay. You had to say goodbye to me for months at a time when I’d leave for dad’s. That must have been hard. I have such a hard time saying bye to your grandson for much more than a couple days. You had to deal with my selfish, me-first, independent, only child nature. I took EVERYTHING for granted when I was a kid, mom. Everything. Love. Money. Safety. Health. Fun. Friends. Family. Laughter. Innocence. Spiritual peace. And you, mom. I took you for granted. I still do. You can tell because I don’t call you enough. Because I still am so good at doing the me-first, only child routine, even all these years later. I think you carry a lot of guilt about my childhood. Questioning some of the choices. Wondering whether you could have done anything different to give me a better life. It’s been a rough go in my thirties. Everything just seemed to go to hell right then. And it has taken me a long time to find my way. I still haven’t found it. But I’m not just wandering aimlessly anymore. I feel close. Mom. You’re why that’s possible. You’re why I get to feel any sense of hopefulness and excitement about my future. You dedicated your existence to providing me with the guidance, life lessons, kindness and decency, principles, and spiritual foundation that have allowed me to feel alive again. Without you, I might not know what love looks like. Without you, I might not understand what it means to forgive, or be forgiven. Without you, I might not be alive because I didn’t know being alive could hurt so much until one day it did. Mom, without you, I couldn’t be me. It was so easy to not like who I was throughout these past years. Self-loathing. You probably know the feeling because I think everyone whose lives don’t turn out absolutely perfect feel it. And I’m pretty sure that’s all of us. Even those whose lives seem particularly charmed. And you know what saved me? All of the things that you instilled in me, via genetics or example. Love and kindness live inside me and the days worse than I’d ever imagined couldn’t kill it. Friendliness and smiles are my gift to those near me because most of the time I don’t even know how to be another way. Hope is my favorite word. My favorite idea. Hope. Always. I’ve taken to saying the following, and I love it because it’s always true and always will be: There’s no reason that today can’t be the day the best thing that ever happens to you, happens. I am genuinely hopeful, mom. That I can be a better man today than I was yesterday. That I can be a better father. A better friend. A better writer. A better son. I am ashamed of my failings. And I’m sorry for all of the times I didn’t act grateful for all you’ve done. And I’m sorry for all the times I might seem ungrateful in the future. But I need you to believe that deep down in the places no one gets to see, that I am trying to do good. To be good. To be a teeny tiny part of making this world better than I find it. I would never want to be anyone but me, mom. Ever. I’d trade nothing but some poor choices. So much of the good that lives in me is because of you. In many ways, I am you. Thank you for my life. Thank you for dedicating so much of your life to mine. Thank you for teaching me how to love. You sacrificed everything (nearly your life, mom—I don’t forget that) for me. And I’m not going to waste it. That’s my birthday gift to you, mom. And I hope it’s enough. I love you more than I say. I appreciate you more than I act. And I’m still chasing those dreams. The ones you instilled in me all those years ago. And now it’s time to start running faster. I know this life can be beautiful. Because I’ve lived beautifully. And it’s because of you. I still care about making you proud. And I still intend to. To many, many, many years. I’m sure most mothers feel exactly that way. You just keep loving them. I think the rest takes care of itself. I hope your mom gets SOME VERSION of this letter, mister. PS – my mom’s bday was yesterday…and she was only 19 when she had me. And she struggled to raise me and my two siblings after she divorced my dad. It’s a crazy thing…the similarities….once one starts looking. Happy Birthday, Matt’s Mom! You are a testament to motherhood. Thanks for raising an awesome son…and thanks for the quirky things you aren’t afraid to say out-loud. This is such a great letter! I also hope your mom will get to see this (or some version of it)! It makes me want to call my mom and tell her I love her as well, which I will not do now but I will see her in two days and I think I will tell her then! Thanks for sharing this! Well said – all men should write such a letter – in their best cursive and mail it. 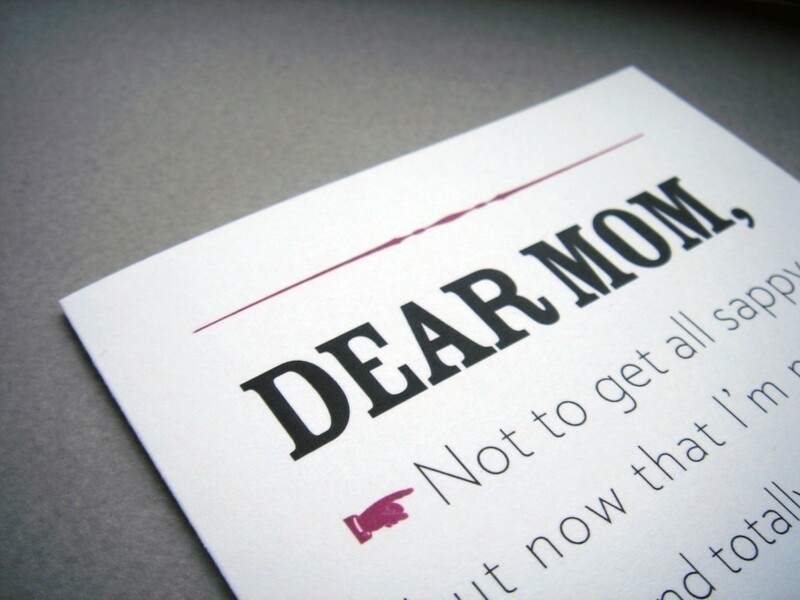 Thanks for the reminder – I hope your mom gets the letter…. Been thinking about you buddy – have a get day and thanks for the reminder to be grateful. Happy birthday, Matt’s Mom. And way to go. You raised a fighter who works to be a good dad and who writes his rump off. Well played. Now make sure he sends you this breathtaking letter as well as a gift card to the nail salon or Cracker Barrel… because even a great Mama needs some pampering sometimes. This struck a chord in me. My Mama is the most loving. We’ve been feeling her unconditional love in many ways since our family dropped in low at some point and she was the only one who stood by us. Reading this letter makes me realize even more that Mama deserve too all the love and gratitude we could give to her especially at this point in her life that she’s retired and time to enjoy the fruits of her year long hardwork and sacrifices. Talking about my mother has been my all time favorite blog post topic to honor her and show appreciation. She would feel like crying when she reads my post about her and I find it amazing because I know that’s what feeds her soul. She’s a sucker to letters and cards personally made for her. It is a beautiful word, hope.